Why is Seafood HACCP Safety Training necessary? A major selling point of seafood is its quality - and seafood safety training is key to that quality. Likewise, the seafood industry is constantly evolving - so it is critical for owners and employees to stay up-to-date on seafood practices, trends, product knowledge, and regulatory requirements through safety training. The nation’s $60 billion seafood industry employs about 250,000 workers, and the U.S. is the third largest consumer of seafood in the world. To ensure seafood safety, the U.S. Food and Drug Administration (FDA) established strict regulations for handling seafood in 1997. These federal regulations require that all seafood processors undergo training outlined in the principles located in the FDA's Seafood HACPP webpage. Maintaining safe seafood requires caring for the product from the time it is caught until it is consumed and that responsibility doesn’t end at the point of sale. Local, state and federal food safety regulations require that fishermen – just like others in the seafood supply chain – be aware of and use proper handling and storage practices to ensure a safe product. First, learn about seafood safety by taking a training course or obtain a certification as required. Second, learn about and use the best handling and sanitation practices for the seafood being sold and the type of market. Guidance can be obtained from local, state, and federal agencies involved in regulating seafood safety. The Seafood HACCP Training Course was designed to meet the training requirements established under the U.S. Food and Drug Administration (FDA) mandatory Seafood HACCP Regulation (21 CFR Part 123). Training Audience: Seafood retailers, seafood safety inspectors, fishermen, health professionals, and students interested in seafood careers - can all benefit from seafood safety training - which in turn, will lead to a higher quality seafood product for the consumer. 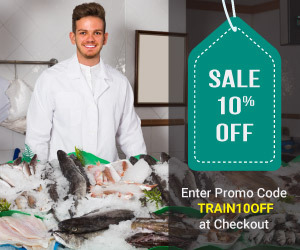 This online training course was developed to provide an easy method for individuals from the seafood industry and regulatory community to get training on the application of HACCP principles to seafood products on their schedule. More Info/Choose Your State. Fishing – in all its forms – is a $72 billion per year business in the United States and that business is vital to the economies of our coastal communities. At the same time, U.S. fishermen and local economies are struggling in large part as result of years of decline in fishing. The economic activity generated by U.S. fisheries and aquaculture creates almost 2 million jobs – from boat captains and crews to oyster farmers and the people working in seafood processing plants, seafood markets, and restaurants. Over 84% of the seafood consumed in the United States is imported contributing to a $9 billion annual seafood trade deficit. The primary food safety risk associated with seafood is foodborne illness caused by microorganisms or naturally occurring toxins. Illness is usually associated with improper harvesting, handling, storage, or preparation. Keeping seafood safe is critical to the long-term success of seafood markets. Those seafood products that are consumed raw or partially cooked represent the highest risk. Other risks are for individuals who catch and eat their own fish or shellfish from lakes, rivers, streams, bays or harbors that are contaminated with industrial pollutants. Customer Support Access our knowledge base, troubleshoot issues, e-mail or call our customer support desk.